The 107032-06 field conversion kits can convert most manual Newton Kwik Dump valves to electric operated, some exclusions do apply. The assembly kit includes an actuator, all necessary brackets, nut and bolts to complete set from manual to automatic. Directions are also included. The kits are available in mild steel and stainless steel. The 108032-06 field conversion kits can convert most manual Newton Kwik Dump valves to electric operated, some exclusions do apply. This electric conversion kit can be used on left or right side operated dump valves. The assembly kit includes an actuator, all necessary brackets, nut and bolts to complete set from manual to automatic. Directions are also included. The kits are available in mild steel and stainless steel. The 501832-12 is manufactured in mild steel and has a 12" stroke extension and can be installed in the field. This electric conversion kit can convert most manual Newton Kwik Dump valve extension chutes to an electric operated chute, some exclusions may apply. The assembly kit includes an actuator, all necessary brackets, nut and bolts to complete installation and set the extension chute from manual to automatic. Directions are also included. This kit is also available in stainless steel. The 501832-18 is manufactured in mild steel and has a 18" stroke extension and can be installed in the field. This conversion kit can convert most manual Newton Kwik Dump valve extension chutes to an electric operated chute, some exclusions may apply. 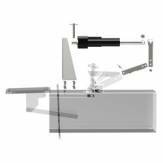 The assembly kit includes an actuator, all necessary brackets, nut and bolts to complete installation and set the extension chute from manual to automatic. Directions are also included. This kit is also available in stainless steel. The 501832-34-12 is manufactured in stainless steel and has a 12" stroke extension and can be installed in the field. This conversion kit can convert most manual Newton Kwik Dump valve extension chutes to an electric operated chute, some exclusions may apply. The assembly kit includes an actuator, all necessary brackets, nut and bolts to complete installation and set the extension chute from manual to automatic. Directions are also included. This kit is also available in mild steel. The 501832-34-12 is manufactured in stainless steel and has a 18" stroke extension and can be installed in the field. This conversion kit can convert most manual Newton Kwik Dump valve extension chutes to an electric operated chute, some exclusions may apply. The assembly kit includes an actuator, all necessary brackets, nut and bolts to complete installation and set the extension chute from manual to automatic. Directions are also included. This kit is also available in mild steel.